In the dramatic setting of the Malvern Hills and surrounded by a beautiful deer park, arboretum and lake, this fairy-tale castle is the home of the Hervey-Bathurst family. 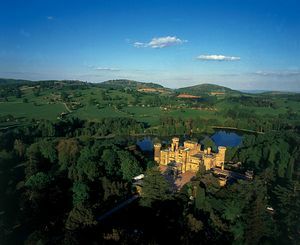 Eastnor has undergone a triumphant renaissance in recent years, and many of the Castle treasures are now displayed for the first time in richly decorated Italianate and Gothic splendour. The Castle grounds contain a famous arboretum of spectacular rare trees descending to a 22 acre lake. The deer park beyond, on the western slopes of the Malvern Hills, has been designated a Site of Special Scientific Interest within the local Area of Outstanding Natural Beauty. Caravans, Camping and Outdoor Events. The Castle is 2.5 miles east of Ledbury on the A438 Tewkesbury road. Follow Brown tourist signs for Eastnor Castle.